Aimed at prosper growth in our domain, we are instrumental in manufacturing an excellent quality Color Stamp. Add the high-end look of foil to your logo with color stamping. Simple one-color designs are enhanced when a die is used to apply colored foil to a material’s surface. A wide variety of stock colors are available, including metallic gold and silver. We offer a wide array of Pre-Inked Stamps for our clients, which can be customized in the form of round, square and rectangular stamps. 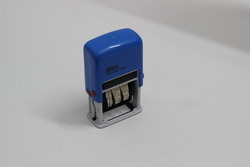 These encompass polymer and self-inking stamps, bank dater and pocket cases. The client can place the orders that can either be sent using the e-mail of fax. We have gained high acclamation from clients owing to its unmatched quality and durability. These smart and small sized stamps consist of the prints date, ready made matters and much more that clients want. 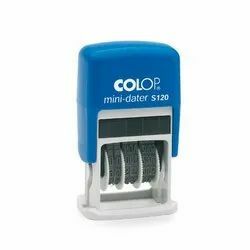 We offer the Mini Dater Stamps to clients in 12 in 1 ready to use matters having a provision of printing date as well.